← SeaDek, Perfect for Sailboats! After a few hours of hiking out on the JY15, as with any sailboat, you can develop minor bruises or discomfort where the pelvic bones meet the hull. 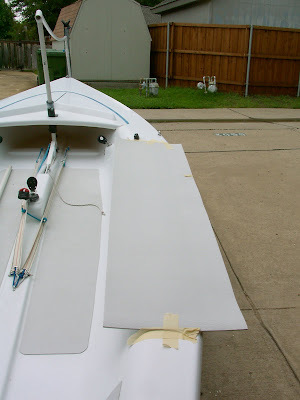 To eliminate the painful posterior SeaDek non-skid “padded” sheets were installed on the JY15 as described in the steps below . -Purchase on the internet two SeaDek 18″ by 74″ 5mm thick sheets, in the color you want, to cover both tank hiking areas. Position the Seadek nonskid sheet for tracing. Position the nonskid sheet over the side with masking tape. The top of the pad was positioned within an inch of the jib cleat. Mark your cutting lines on the nonskid sheet. Trace a line on the bottom side of the nonskid sheet following the curve of the beam. 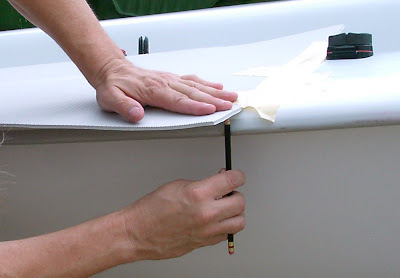 To get your cockpit side marking on the sheet measure at least a 13″ width at the highest point and gradually reducing the width down to a minimum of 10″ at the stern using the arc of the previous outside edge tracing as the reference point. Also the full 74″ length of the nonskid surface was used for a couple reasons. 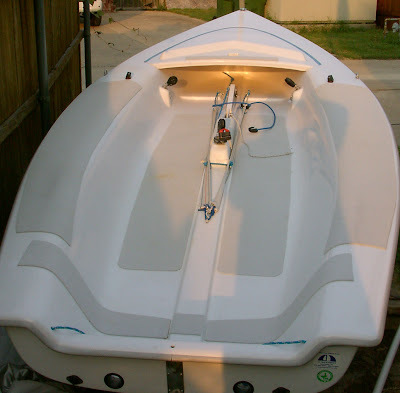 Not only does it provide a longer comfortable hiking area, but also acts as a Tiller Guard and protects the sailboat surface from uncontrolled tiller swing to either side of the boat. Setting up a cutting guide – optional. A cutting guide was created using a quarter round molding clamped to follow the outside line I traced in the previous step. This is not necessary if you are good at following lines with a box cutter or scissor. I successfully did the other side without the guide. Cut the material at a slight angle so the edge is beveled out at the bottom of the sheet. Use one sheet as the template for the opposite side. Take the first cutout and use it to trace the template for the other side. Be sure you place the sheets back to back, or as the picture shows sticky sides together to get the correct cut for the opposite side. Apply the nonskid cutouts to the tanks per SeaDek recommendations: clean the surface with something like Windex, peel back paper cover partially at starting point, and apply pressure across the surface as you peel back so air bubbles to do not get trapped. Take your time, check the positioning, and adjust as you roll out the sheet. The material is flexible enough that you can make slight changes as your roll it out to insure proper placement. JY15 with a complete complement of nonskid surfaces. The picture below shows the JY15 with a complete upgrade and additions of the nonskid SeaDek material: hiking area, boom protection at bow and stern, tiller protection, cockpit, and centerboard hump. 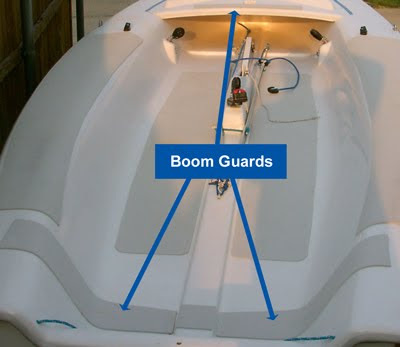 You will notice that there are protective strips of nonskid padding in front of the transom and behind the mast hole where the boom lays on the boat as the mainsail halyard is lowered. You can use your left over scraps for these areas. 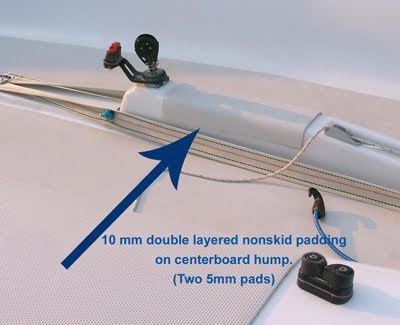 Double layering nonskid(10 mm) padding on the centerboard hump makes a more comfortable sitting position for the crew. 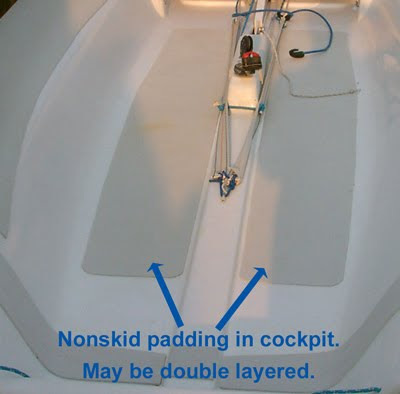 The original cockpit nonskid surfaces were also replaced with the SeaDek material. It does a great job without the sandpaper burns on the knees experienced with the original nonskid surface. You may want to double layer these cockpit nonskid pads for better protection to the knees. 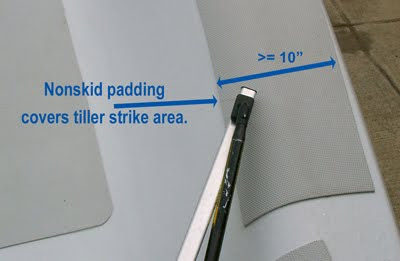 The width of the nonskid hiking surface at the tiller point must be wide enough, at least 10″, to wrap down into the cockpit in order to protect the surface. Bottom line – the JY15 is painless in the cockpit with the SeaDek nonskid padding. SeaDek would like to thank the author for the time he spent putting it together and for his continued support and advice regarding SeaDek’s many applications in the sailing community. This entry was posted in Uncategorized and tagged no skid, non-skid, sailboats, sailing, seadek. Bookmark the permalink.